What about this game appeals to you? I'm a huge fan of D&D! I've played for the last 12 years, though this is my first time trying a post version. The combat/dungeon centered theme of the campaign is what drew me. I've DMed for many games, so I do enjoy roleplaying, but the games combat aspect is just so fun! Is there anything about this game concept that doesn't appeal to you? I have in one campaign done a facebook messenger post system where we chatted about the game and finished off some stories by posting there, and it was a challenge to explain the image i had in my head to all the players with just words. There was some confusion, and we eventually avoided combat there. So I anticipate some challenges, but I'm also eager to see how you tackle those same problems. Any questions you might have? For my character the wizard needs a spellbook to function, however, it's cost alone is 50gp (your limit). In the character sheet I put things together assuming I'd get it for free, but I wanted to clarify it with the DM first. Experience with 5e I've DMed mostly from 5e for 4 games each lasting about a year or over that. I'm very familiar with the rules, and how the game works. Expected Post Rate As i mentioned before this is my first foray into this kind of game. I will meet the expectations of the DM without problems though. In your description you described your expectations as at least 1/day. Backstory Ezraharden has been a traveling wizard for most of his adult life. He gets by using his magic to aid folk as he travels in exchange for food and shelter. Seeing new places and meeting new people is the delight of his life. He is looking for new adventure on the horizon to help him forget his many mistakes from the past. Trait: "I don't mind dramatics, as long as i'm the center of it." Ideal: "Any event I am part of, good or bad, is a tale to sing of in my story." Bond: "My instrument is more dear to me than any friend." Flaw: "Wanting to be the hero of her own famous story Lilith can be overly energetic, narcissistic, adventurous and ambitious regularly leading her into trouble"
Lilith has long silvery grey hair reaching down to her mid back, pale skin and large silver eyes with a hint of purple dotting around the iris. She stands at 5'7, 120lbs. She is strikingly beautiful but usually looks friendly, cheery and approachable. Her ears are only very slightly pointed and mostly covered by her long hair. She carries her lute over her shoulder and prefers bright colors on her outfits. She wears a thin belt around her waist where you can see hanging an elegant looking rapier, on the other hip a couple small plain daggers. Lilith had a pretty uneventful childhood. 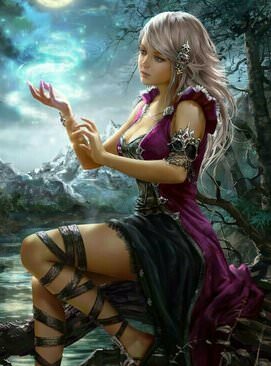 She was raised by her elven father Elmon, captain of the villages small army and half elf mother Aila, a talented musician. Growing up close to her mother she quickly took to music, song and poetry. Her talent impressing even the oldest elves in the village. Ever since she could remember, she dreamt of one day being like one of the famous heroes and adventurers she sung of in her songs. At first her parents laughed and played along with her whimsical dreams, but as she grew older it became clear to them and the village that this wasn't just a fleeting childish fancy, she was serious. Lilith was determined, so they began to train and prepare her for her journey. She trained in hunting and foraging with the village huntsmen, trained in combat with the guards and her father and learned the basics of magic from the elders. On her nineteenth birthday she said goodbye to her village and set off to create her own stories, promising her parents when she returned to sing to them about most amazing adventure anyone as ever heard. Open party structure, easy to join, welcoming to newer players and hopefully high post rate. I fear since its a dungeon crawler I wont have the proper outlet to role play my character to the fullest. Average to above average. I know what I'm doing. I am however new to play by post. What about this game concept appeals to you? simple dungeon delve to test a character. Experience with 5e 3yrs on rpg, crossing lots of study on characters, critical role. Last edited by delpinator; 11-25-2017 at 11:47 PM. I would prefer a higher starting cash for some concepts like wizard/ranger but not a big deal. Have only DM in a home brew campaign in 5e so I’m itching to play any of the characters I have waiting to play. Seems like a good way to dive into a game and not having to think about a whole bunch of detail story in a few seconds and just play and improvise. What about this game concept appeals to you? Yes, frequency of posting the most! Last edited by Gamemaster0007; 12-10-2017 at 09:30 PM. I may be interested in joining this game. I presume my character from City of Endless Arenas will not transfer to this. I am willing to play this game as a 1st level of mu CoEA character once I retire him from there. That won't be soon at all he has a lot of playing left to go. Just sending an interest. PM me if I can do what I am proposing to do. I am not Agrudez but I am also not sure what you are requesting -- so they may not either. Does the City of Endless Arenas have the same format for character creation? If yes and you are starting this character off at 1st level when you bring them over to Dungeon Dive -- I see no reason why anyone would say no. 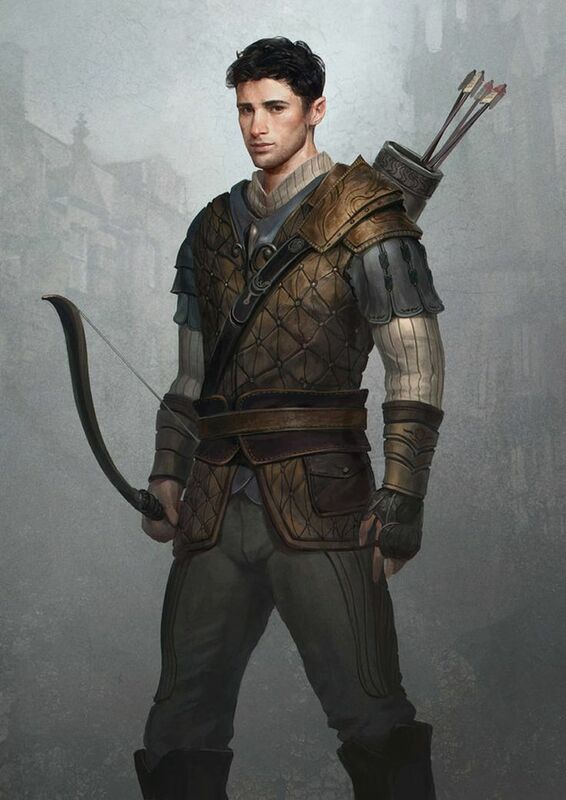 However if the City of Endless Arenas does not have the same format as Dungeon Dive for creating characters then I would imagine they would say no -- as that would most likely open a can of wyrms that Agrudez would most likely not want to deal with especially if the CoEA format allows you to create a better starting character than DD does. Or if you are asking can I bring my character over after leveling them up in CoEA then again I think they would most likely say no for basically the same reasons. If you are wanting to say your character sailed here from wherever the City of Endless Arenas is located I do not think that would be an issue as long as it is understood that characters currently cannot just go from one to the other without first Agrudez and the owner of CoEA working out some kind of collaboration deal. Last edited by DeJoker; 12-22-2017 at 05:00 PM. Yeah but in the meantime you might want to clarify what it is you are asking -- I did cover more than one possible question based off your original post. I'm pretty sure it is pay in for the stats when I created my character. We went with the standard equipment to start like for instance my character is a dragonborn barbarian so I went with a greatsword, a buckler shield, and regular leathers armor.. I also had a backpack to start with various throwing weapons since my background is soldier. Okay well that is slightly different than what was done in Dungeon Dive -- Standard Buy is done but when it comes to possessions everyone ony starts with 50gp and you have to earn the rest in game. I presume the health potions and consumables need to found in the dungeon and any random things found in the dungeon. No you can buy the health potions and even magic items if you got the scratch but its gettin the scratch to satisfy the itch that is problematic -- the game is pretty straight forward and all said -- why not just create a version of the character that fits the rules for character creation for Dungeon Dive and run them in both places -- different games might make for different final builds *shrug* -- I am not seeing how having a character previously in CoEA makes much difference if you are basically just going to be starting the character from scratch in DD ?? I would just start a character in DD now from scratch and go with that. OK probably do this after christmas.